Phoenix is the capital and most populous city of the U.S. Kick off your visit on the 9th (Thu): push the limits with an extreme tour. For ratings, other places to visit, traveler tips, and more tourist information, use the Phoenix vacation planner . Los Angeles to Phoenix is an approximately 4-hour flight. You can also take a bus; or drive. Due to the time zone difference, you'll lose 1 hour traveling from Los Angeles to Phoenix. Expect somewhat warmer temperatures when traveling from Los Angeles in May; daily highs in Phoenix reach 93°F and lows reach 69°F. Finish your sightseeing early on the 9th (Thu) to allow enough time to travel to San Francisco. 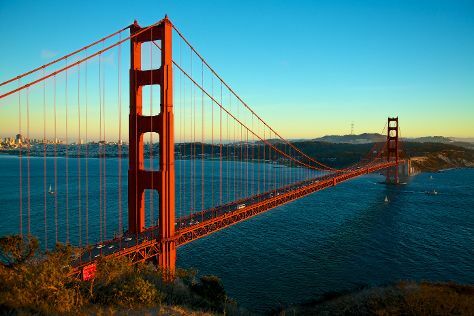 Start off your visit on the 10th (Fri): examine the collection at de Young Museum, then take in the views from Golden Gate Bridge, then take in the waterfront at Fisherman's Wharf, and finally head off the coast to Alcatraz Island. To see maps, other places to visit, ratings, and more tourist information, you can read our San Francisco day trip planning tool . Getting from Phoenix to San Francisco by flight takes about 4.5 hours. Other options: do a combination of flight and train; or drive. Traveling from Phoenix to San Francisco, you'll gain 1 hour due to the time zone difference. When traveling from Phoenix in May, plan for much colder days in San Francisco, with highs around 69°F, while nights are slightly colder with lows around 53°F. Finish your sightseeing early on the 10th (Fri) to allow enough time to travel back home.